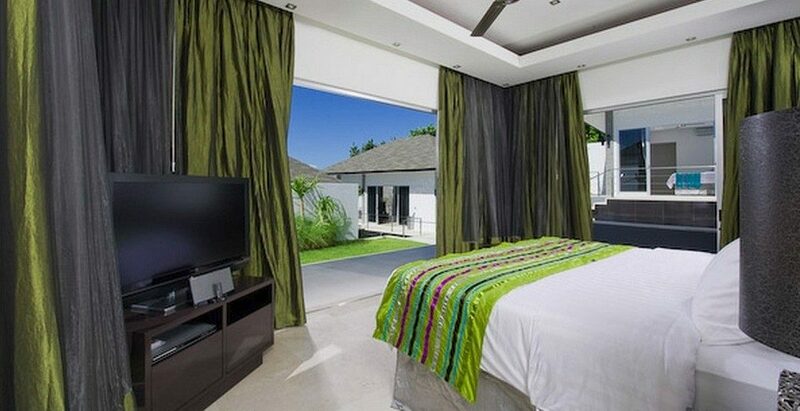 Suluban Cliff Villa is located in South West Bukit Peninsula of South Bali or Uluwatu area. 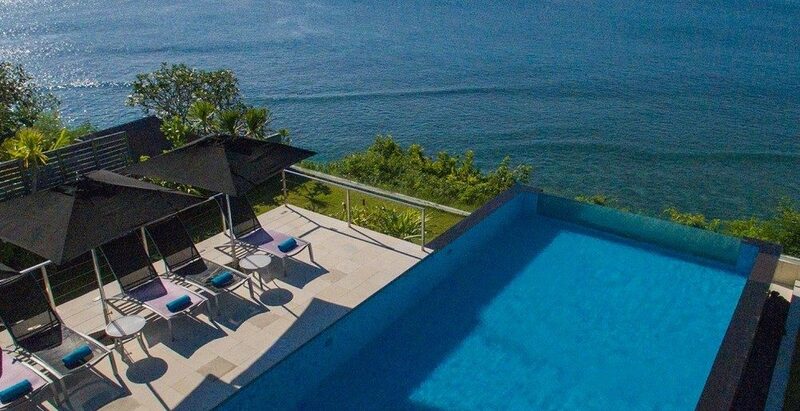 Nestled on a cliff, the Suluban Cliff Bali Villa features a luxurious 4-bedroom villa with a private infinity pool that overlooks the Indian Ocean and Padang Padang Beach. This property offers pampering spa treatments and provides free parking. Staff can make arrangements for yoga, diving and hiking activities. Guests can indulge in a body massage, or rent a car to explore the area. Airport shuttle services are also available upon request. In-villa dining option can be arranged as well. 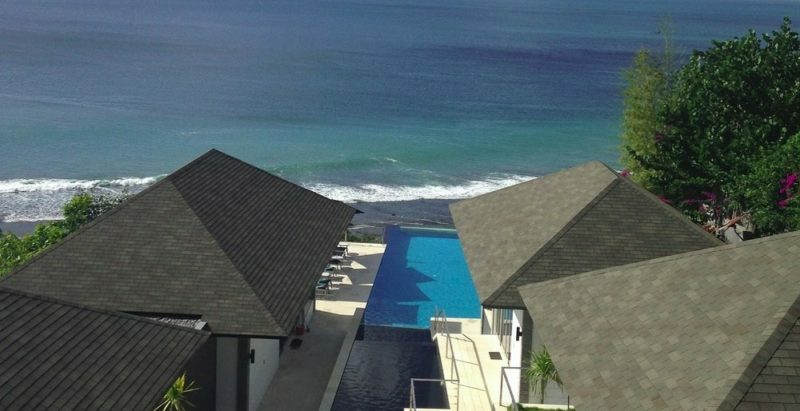 Bali Suluban Cliff Villa is a 5-minute drive from Uluwatu Temple, the Blue Point surfing spot and Padang Padang Beach. 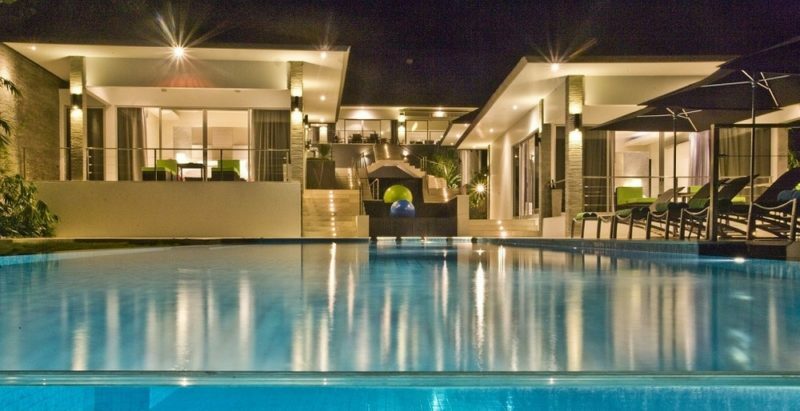 It is a 15-minute drive from a variety of local restaurants and a 45-minute drive from the lively shopping areas in Kuta and Seminyak. 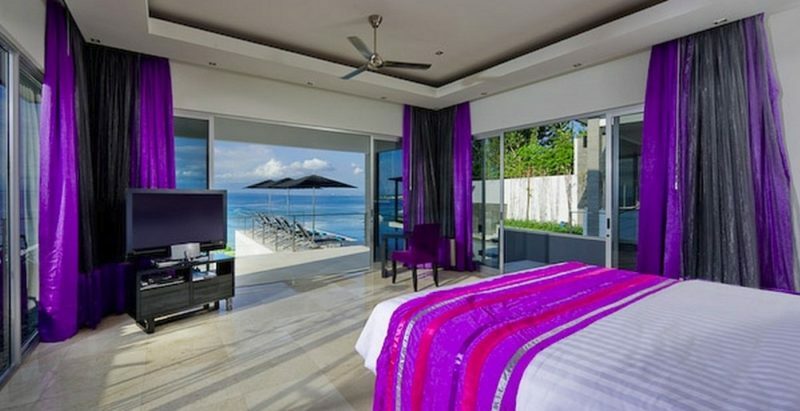 The ever spacious master purple suite comprises a super king size bed that hides a full size pull out single bed beneath. Silver silk headboards, purple silk drapes, funky lamps and matching bedside tables set the chic style. Spot the marine life or feast on the stunning panaromic view of the Indian Ocean and north Bali skyline. 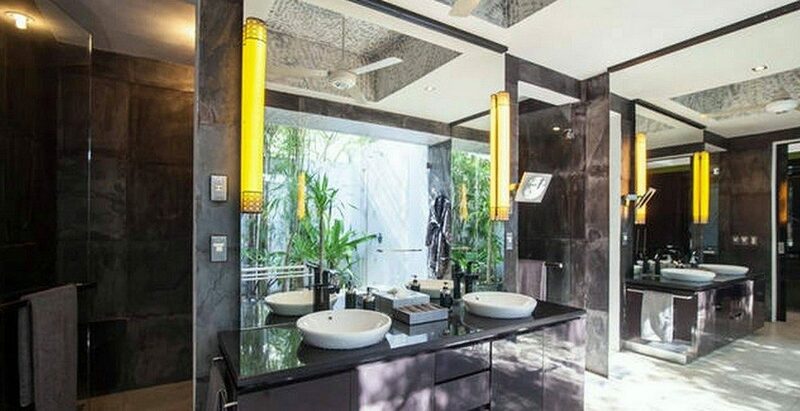 The unusually large wardrobe space in customized black gloss lacquer panels and purple interior leads to the equally spacious mirrored ensuite bathroom with opposite double vanity stations. Air-conditioned separately from the bedroom, the ensuite bathroom is luxuriously fitted with chrome basins, Italian black satin designer taps, vanity mirror , rain and handshower taps . The ensuite leads to an outdoor bathtub has been positioned to enable a vista of the ocean through a window opening. The Purple Suite naturally opens onto the spacious terrace with gorgeous cliff front view. 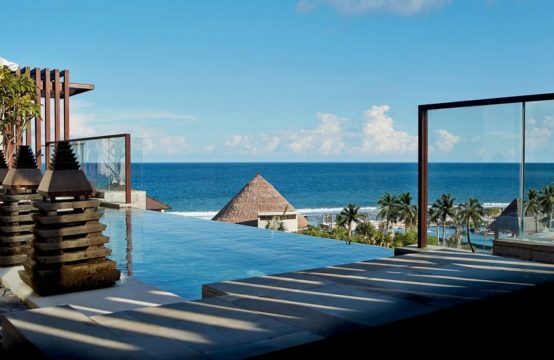 Here, soak in the unparalleled views of the rolling surf, crescent shaped Suluban beach and its limestone outcrop and the Bali south west skyline. 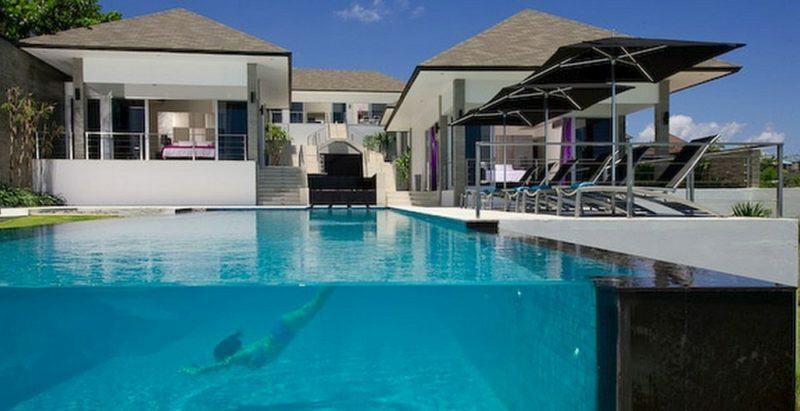 This pool suite comprises a super king size bed that also hides a full size pull out single bed underneath its frame. Silver silk headboards against textured “floating wall” blend in with the luxurious silver silk and metallic grey organza drapes. The large wardrobe space in custom finished black gloss panels and fuchsia interior leads to the spacious ensuite bathroom with double basins in customized black gloss & fuchsia finished vanity. 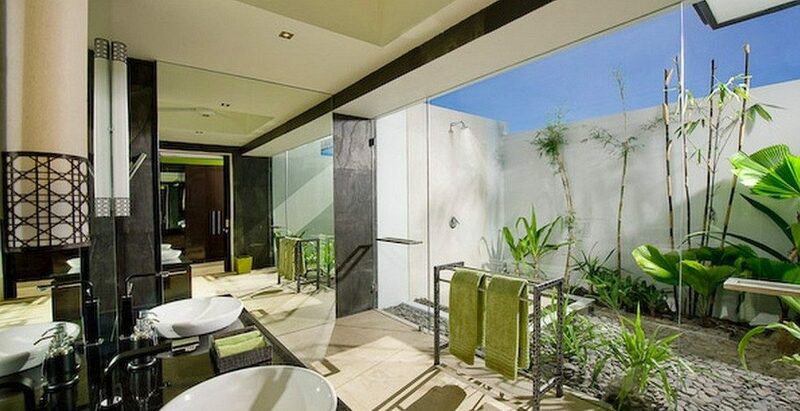 Adjoining the ensuite is the Bali style outdoor shower set in a minimalist pebbled garden. Only the frameless glass panel and doors separate the ensuite from the outdoor garden & shower area giving you a sense of the outdoor merging with the ensuite. 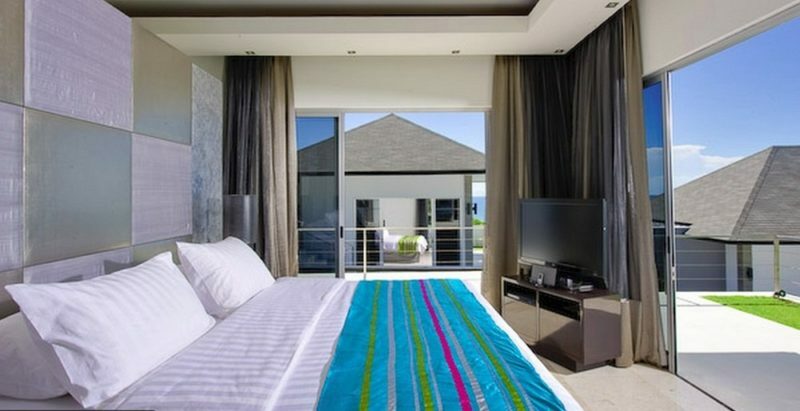 The bedroom area naturally opens onto its own private terrace with fabulous views across the infinity pool to the Indian Ocean and rolling surf. 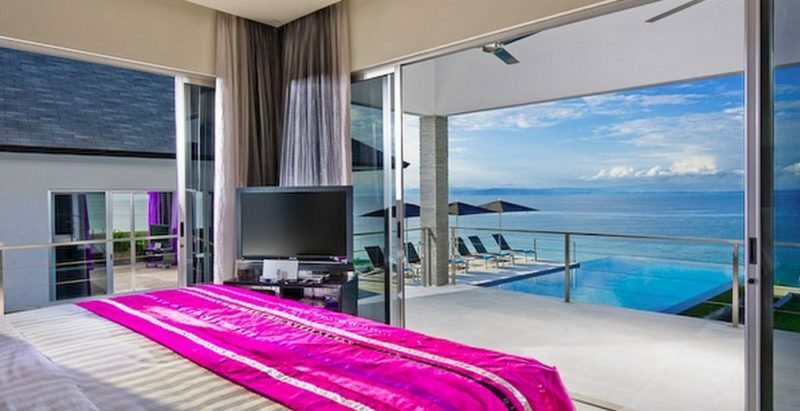 Situated on the western part of the property behind the purple suite, the Lushgreen Suite still commands a vantage view of the ocean and rolling surf. Its super king size bed with matching bedside tables accommodates a pull out single bed under its silk valence. The glass sliding doors decked with lush green silk and grey organza drapes, opens to the suite’s minimalist garden terrace. To the east of the suite is the sight and sound of the cascading reflective pool that transverses the centre of the Property. The ensuite bathroom, with its mirrored wall and glass panel, enjoys a spacious outdoor shower & pebbled garden view. 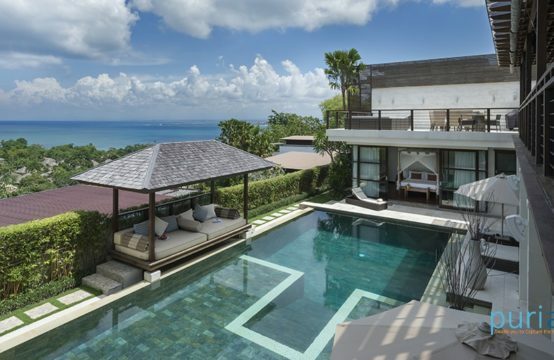 The Turquoise Suite also commands the ever-present ocean view in this Property Villa. Its custom finishes of smoky black ranges from the super king size bed frame with the pulled out single bed, bedside tables, wardrobe panels and bathroom vanity drawers. Here champagne silk and grey organza drapes the glass sliding doors that open to a minimalist garden terrace elevated to the right of the central reflective pool walkway. The already spacious double vanity ensuite is further enhanced with the use of ceiling to floor mirror and paneled glass that brings the outdoor view inside. cliff edge dining bale & bar. *Rates are subjected to 15% tax and service charges. Please email us if you would like to make a booking after this date.